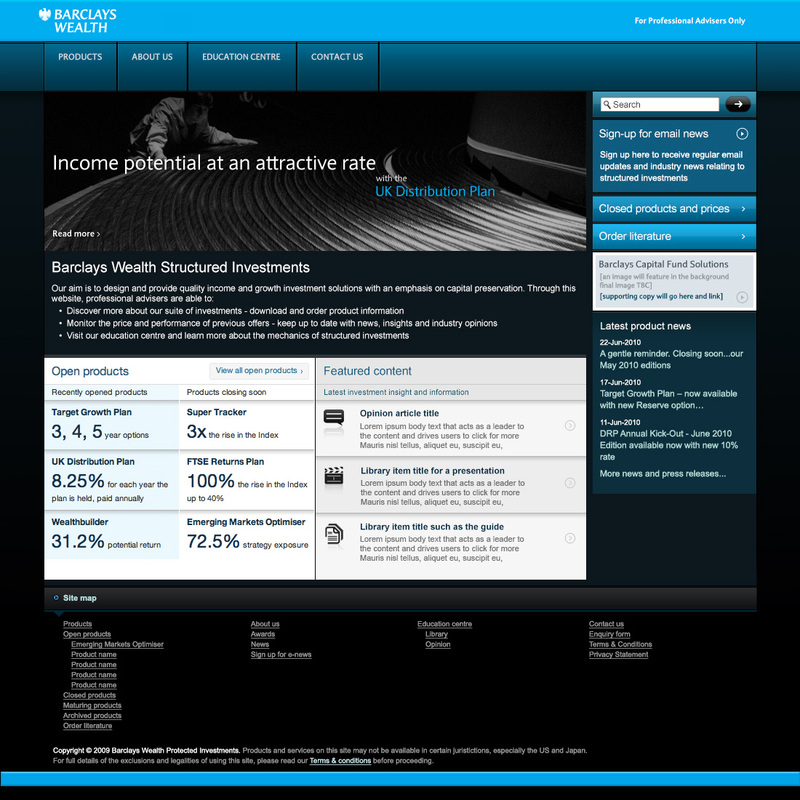 In 2008 we partnered with MRM communications in London to offer an integrated design and PR solution to the protected investments team in Barclays Capital who were trading under the Barclays Wealth brand. 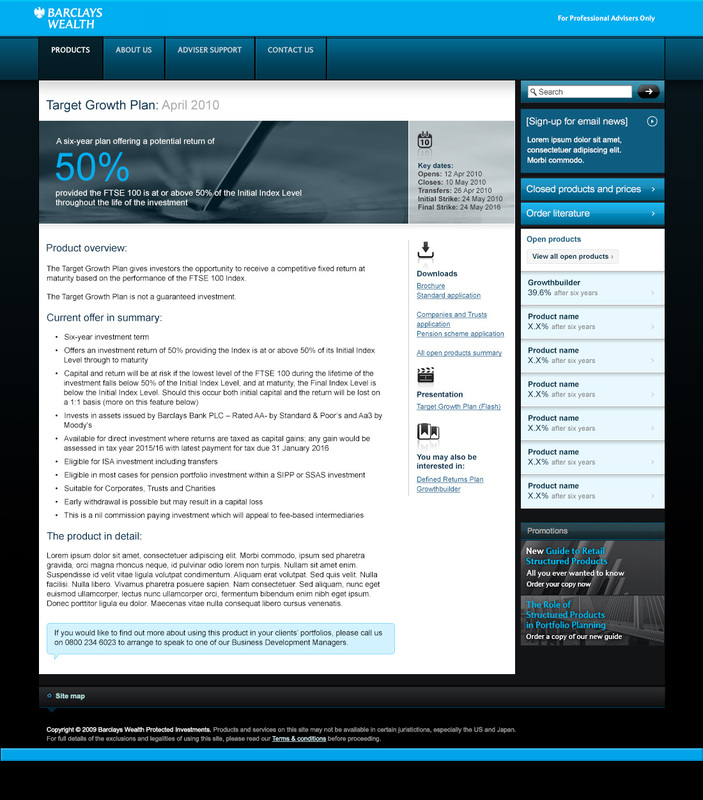 We worked with them to develop an online presence that was befitting of their brand and set them apart as a leader in their marketplace for offering investment pricing feeds. We put in place a bespoke content management system to allow the client to add and schedule the addition of pages and new content to their site, including a bespoke blogging tool. During our time working together we drove web traffic levels up 400% and grew their email database, with real and valuable contacts, from 3,000 to 12,000 with a solid and trustworthy email marketing campaign. Our creative solutions were led by the exacting Barclays brand guidelines, though these only focus on offline implementation, so we had to take the lead in creating and developing an online style that reflected those offline guidelines. This project is a great example of how we hold our clients existing brands in high regard and manage their visual identity with the utmost responsibility, sometimes refusing to do things that would otherwise weaken their own brand – and so acting as a brand guardian, despite not being the creator. In 2011 the individuals we worked with were moved to a different part of the business as a result of the success of their team in growing the protected investments business – which they acknowledged was helped greatly by our work. The new individuals tasked with running the protected investments work decided to use the in-house team at Barclays to deliver their marketing and subsequently our work was dismantled and finally went offline in late 2011.